"Squirrel Buster Plus" features rather sophisticated mechanism for discouraging squirrels from stealing bird food. The mechanism is based on the weight of the animal standing on the perch. When the feeder has no visitors and the perch is not under the weight, the feeding holes are closed by default. This way the feeder protects bird seeds from heavy rains and the wind. Still, the feeding holes are not exactly sealed and there's enough space left for seed ventilation. And then, when the small weight bird steps on the perch ring, the spring inside the feeder mechanism gets to loosen up under the weight and all of the feeding holes open so that the seeds become accessible for birds. But when a squirrel or a heavy bird stands on the perch, the spring mechanism gets over-tensed and the feeding holes get to shut down immediately. So basically, this feeder is constructed as a bird feeder for small birds only. Of course, you can easily setup the spring tension and "fine tune" it to the desired weight of the birds you want to grant the access to the feeder foods. So, no food to the overweight! No wonder why this bird feeder holds number one position among the top ten rated by its customers! 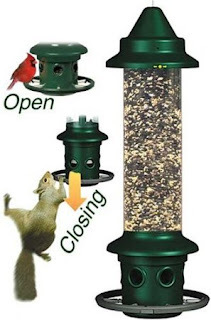 "Squirrel Buster Plus" feeder offers even more benefits: it can host up to 6 birds at the same time as it has 6 feeding holes; all metal parts are rust-free and additionally protected with special paint coating; food storage is made of endurable and ultra violet resistant poly-carbonate plastic; you can easily detach all it's parts for cleaning and mount it back again. The last, but not the least, this bird feeder is wonderful ornament for your garden. If you liked it, you can buy this bird feeder this Amazon.com link. There you'll get to read even more reviews by people who actually bought this feeder.